But the turbulent youth of M stars presents problems for potential life. Stellar flares – explosive releases of magnetic energy – are much more frequent and energetic from young M stars than young Sun-like stars. M stars are also much brighter when they are young, for up to a billion years after they form, with energy that could boil off oceans on any planets that might someday be in the habitable zone. “I like to think that K stars are in a ‘sweet spot’ between Sun-analog stars and M stars,” said Giada Arney of NASA’s Goddard Space Flight Center in Greenbelt, Maryland. Arney’s research also includes discussion of which of the nearby K stars may be the best targets for future observations. 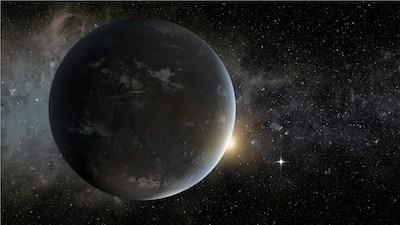 Since we don’t have the ability to travel to planets around other stars due to their enormous distances from us, we are limited to analyzing the light from these planets to search for a signal that life might be present. By separating this light into its component colors, or spectrum, scientists can identify the constituents of a planet’s atmosphere, since different compounds emit and absorb distinct colors of light. “I find that certain nearby K stars like 61 Cyg A/B, Epsilon Indi, Groombridge 1618, and HD 156026 may be particularly good targets for future biosignature searches,” said Arney.